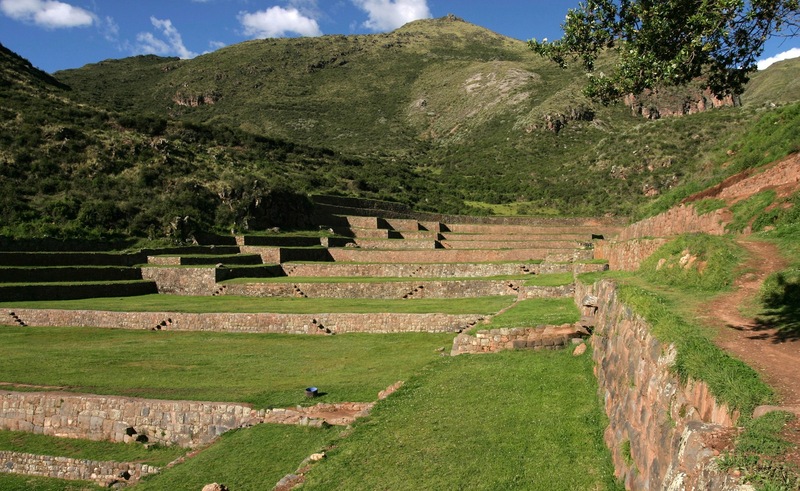 As an emblatic example of the hydraulic wisdom of the Incas, we highlight Tipón. 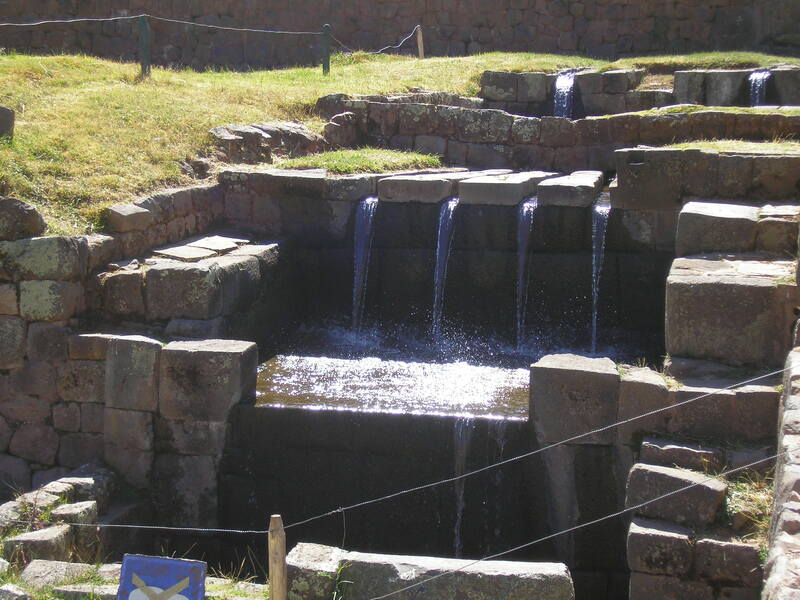 Tipón, a town located about 23 km southeast of Cusco at an altitude of 3560 meters above sea level, located in the Oropesa District, providence of Quispicanchis, was a major shrine where tribute was rendered to the water with care and reverence that the Incas treated this element. This complex has been distinguished as a marvel of civil engineering by the American Society of Civil Engineering. The respect for the natural environment and the technology used to mobilize the spring waters are a model of hydraulic engineering that serve man and nature. This stands out as the only Inca complex that is in perfect functioning. 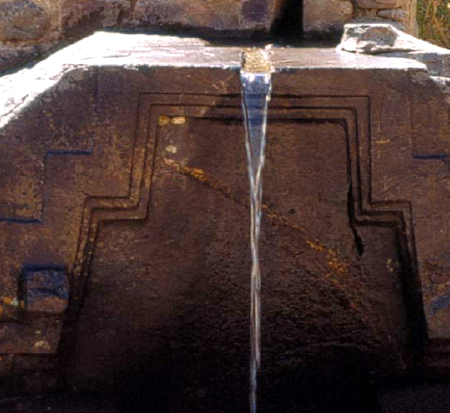 The recognized Peruvian historian, Dr. Luis Antonio Pardo, opinionates that the actual name Tipón may come from the quechua word Tímpuj, which means “To be boiling” and alludes to the boiling waters of the fountain as if the liquids were boiling. This name was assigned in modern times, as its original name was another. 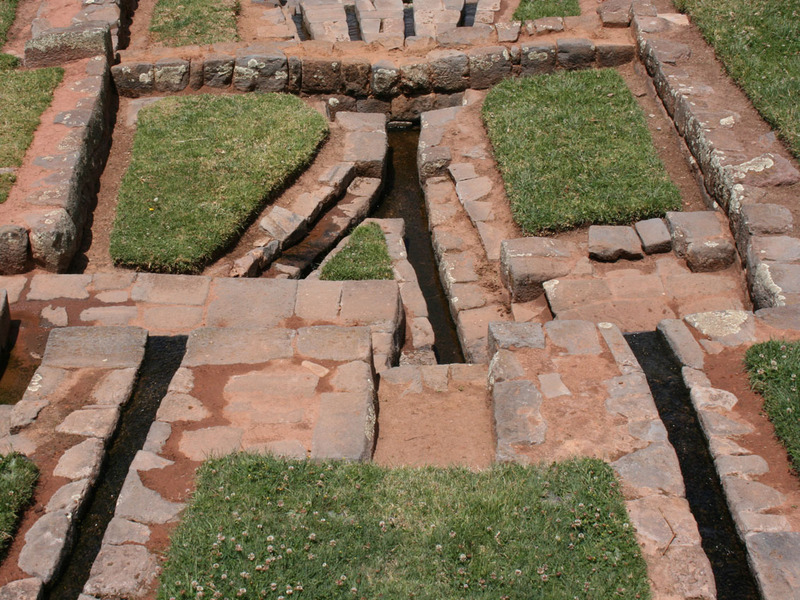 The Cusqueño historian Victor Angles sustains that Tipón could have been the Royal House of Yahuar Huaca, who abandoned Cusco during the attack of the battle-hardened Chancas. Huircocha, his son, confronted the invaders and defeated them, entering triumphantly into Cusco, being crowned Inca instead of his father. The mestizo journalist Garcilaso de la Vega says, “The king respected the determination of his son, because all the courts felt inclined toward his desires, that he was the head of the kingdom; and for avoiding scandals and civil wars and particularly because he himself could not go on any more. The king tolerated all that the prince wanted him to do. With this agreement the later arranged a royal house, between the stretches of Muyna and Quepicancha, in a pleasant place (in fact, everything in that valley is), with all the gifts and delicacies that could be imagined from orchards and gardens and other royal entertainments such as hunting and fishing; that the construction of the house will be close to the Yucay River and many other flows that enter the river.” Angles assumes that the place identified by Garcilaso corresponds to Tipón. The Watanay River passes close to Tipón, and from it emerge two creeks that surround the whole complex. These could be the creeks of which the Inca journalist speaks. 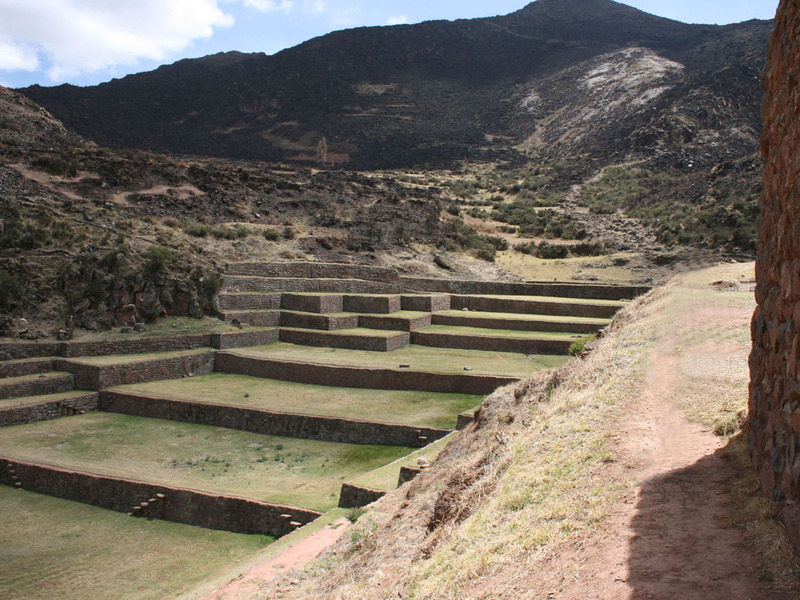 Another resemblance with this complex are the andenes that correspond with the 12 existing embankments in the place. This admirable Inca recreation finds itself sitting over a very irregular surface. In the times of the Inca period, there was no flat or level terrain. It was all modified due to the hard-working Tahuantisuyo habitants for the satisfaction of their old and tattered monarchy. Beautiful dwellings and gardens lifted by a base made of megalithic rock blocks constituting the Royal House that Huiracocha ordered to be built as a resting place for his father Yahuar Huaca. As the most beautiful and ample group of the complex, it is comprised of beautiful fountains and conduits that to this day continue to discharge water, which appears from mysterious and secret underground canals. An oblong, tower-like structure is located to the south of the andenes, and from this point a very impressive view of the entire gorge can be appreciated. 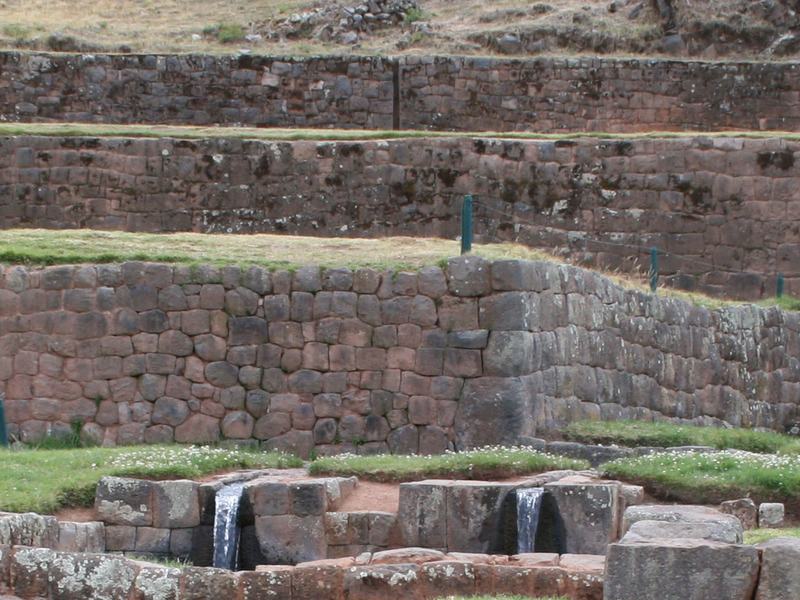 The Incas achieved a very impressive development in its architecture and especially in its hydraulic structure. 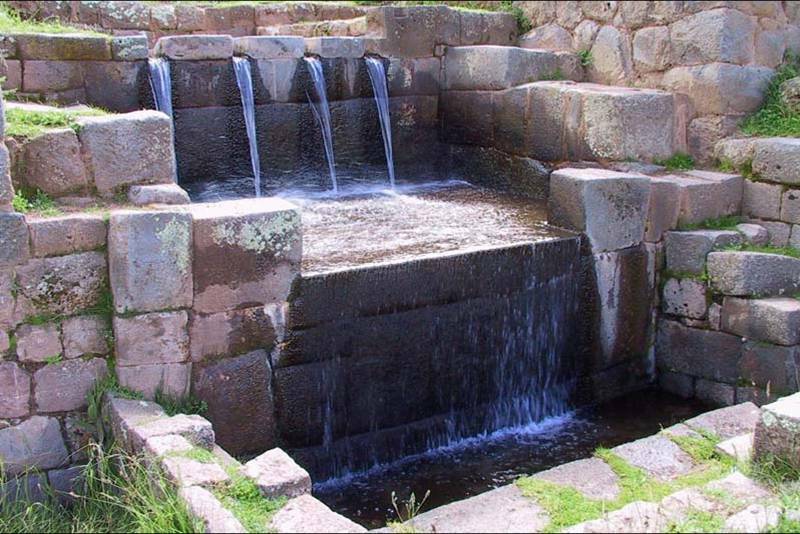 There is no group of Inca archeological structures where one would not appreciate the admirable construction and distribution of water, in such a way that the lack of this liquid element was not a problem. In fact, even today some of the structures serve to provide for the population that lives in that region currently.